Join us at the Diamond on July 26th at 6:35 pm. 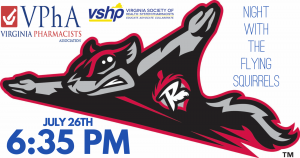 Don’t miss the In-Your-Face Fireworks presentation as the Squirrels take on the Reading Fightin Phils. Tickets are $9 for General Admission seats. Children 3 and under are free. Help us reach our goal of selling 100 tickets by inviting friends, family, and your colleagues. We hope you’ll be able to make this family friendly event!